Editor’s Note: Joe Eastmure was, in the mid-1970’s, one of Australia’s most highly-respected production bike racers. In 1977 he teamed with the late Kenny Blake to win the Castrol Six Hour production bike race at Sydney’s Amaroo Park Raceway. The following is a transcript of an inteview I conducted with him in 1996, and it is reproduced with Joe’s permission, having previous been published in “Flat Chat”, the monthly magazine of Canberra Road Racing Club. Following the 1973 500cc class win on my Suzuki I gave the 74 race a miss but rode an R90 BMW in the 75 race with a notable lack of success. I had not trained hard enough for the race and lost concentration after about the second hour when well up with the leaders and crashed the bike heavily at the top of the straight. This was my only 6 Hour crash but it cost me a well broken collar bone. In 1976 I again teamed with Dave Burgess this time on an R90S BMW. At about the 3/4 mark and looking set for a good win Dave suddenly pulled in just before the last pit stop with a broken piston or rocker arm. Perhaps that was a good thing as the other BMWs were disqualified because of reversed front fork spacers. No doubt our bike would have suffered the same fate. Dave Burgess had suggested dropping dry ice into each leg with the resulting gas pressure giving extra ground clearance but the idea was not tested probably because the fork seals were not secured in the fork leg with a circlip. For the fateful 1977 race Metzeler importer John Galvin asked me if I would like to ride with Ken Blake on an R100S and despite having done no road racing for the past year I jumped at the chance. As my road bike was the old 315 Suzuki from the 72 6 Hour, I borrowed an R90S from Tom Byrne for a couple of weeks and put in quite a few 800-900 km weekends to regain the BMW feel. BMW had interests in 3 teams, Ken Blake/me, Helmut Dahne/ Tony Hatton and Brian Hindle/? and we all generally cooperated for the race. Early practice revealed a couple of problems with the R100S. During early practice they broke gearboxes and this was traced to faulty machining of the gear dogs which left one dog taking all the load. Under racing load the overstressed dog was shearing and taking all the other dogs in concertina fashion. The answer was to have all the gear sets carefully blueprinted to specification by Don Wilson who was in charge of all preparation. Joe rounding the “Loop” at the back of the circuit. Of greater concern was piston breakage. 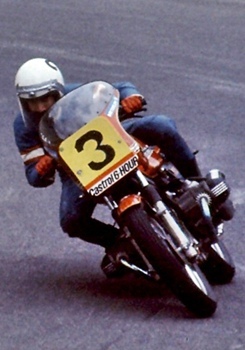 Brian Hindle suffered a very heavy crash a week before the race when a broken piston resulted in a rod coming through the block and ultimately preventing him from starting the race. The broken rod took out the starter motor! BMW informed us very late in the proceedings that a certain type of piston used in the R100S would fail under racing conditions and this late news did not leave us enough time to remedy the problem. As a result we had to pay very careful attention to the rev counter to avoid overreving the engine. I must admit to a missed gear or two and you would hear the valves bounce as, heart in mouth, I tried to find the gear change. The other characteristic noise I remember was the pronounced hum from the front disc rotors when braking heavily. No need to comment about the clunk coming down through the gears because this was, after all, a BMW. Fuel consumption was also a concern as testing showed Ken and I could get 2 hours but there was no margin for error. We adopted the usual practice of using chilled fuel to gain the greatest possible volume. Ken was a great bloke to work with as he had no pretence about him despite being a professional rider with much more racing experience than me. However, BMWs and Amaroo were my forte and with my lap times up to a second faster than Ken’s he never queried that I would do the major share of the riding. as possible while maintaining corner speed and at the Loop I would sometimes get so far off the bike I’d worry about getting back on board. Ken and I must have been pretty successful because at race end the rocker covers were only about half worn through yet our BMW lapped noticeably quicker than the others. Tony Hatton had the misfortune to really hit his hard on a ripple strip causing a hole and then losing time while replacing it. Having big Helmut Dahne as his co rider also must have caused problems in this area. Our race plan was for me to take the first 2 hours, Ken the second 2 hours and I would ride the last 2 hours. I had a mediocre start settling into 4th or 5th position initially. Not having raced for a year I needed to settle back into racing pace and it took about an hour to move closer and closer to my own and the bike’s limits. The R100S was slower than the Z1 Kawasaki of Jim Budd but it could be cornered at least as fast as the other bikes. Jim had set a qualifying time of about 59.1 while I was about 10th fastest at around 60.1. Neither Ken or I were particularly turned on by qualifying and we elected to go for a solid, safe time. I still have the lap charts for the race and they record that on lap 122, just before pitting for fuel, I managed a 59.0 which equalled Crosby’s production bike lap record! Jim Budd had cleared off for the first hour and I spent quite some time with dicing with John Warrian on a Ducati. After about 1 hour light rain started to fall and racing became a chancy affair as no one was prepared to really back off. I remember the awful dilemma of whether I should play safe and slow down or keep into it. My lap times had been anything from the low 59s to the mid 60s but in the rain they went to 61s to 62s. By about 11am I had inherited the lead because of the big fuel tank but was repassed by the Budd/Chivas Kawasaki before handing over to Ken. During Ken’s stint I had to front the Stewards to hear a protest from Mick Hone, it was dismissed. Mick had objected to my rather aggressive passing move at the exit to the Loop where I caught him unawares by taking the inside line. He got such a fright he ran wide and dropped his Guzzi. I must admit the width of the BMW’s cylinders did create a problem when diving for a small gap but I did not actually touch him, I’m sure there were at least a few thou clearance between the left cylinder and his right ear when I went past! Ken ripped off his 2 hours in usual masterly style lapping very consistently in the high 59s to 60s. By about the 31/2 hour mark Jim Budd led Ken by a small margin but when Ken pitted at the 4 hour mark he had regained the lead because Budd had pitted again. Just before Ken pitted Tony Hatton had arrived leaking oil from a grounded rocker cover so my first concern when Ken stopped was to check the right cover. What a relief it was to see the rocker cover still had plenty of alloy left. At every corner Ì would try to avoid scraping the rocker cover and whenever I failed and felt the solid yet oily feeling bump of soft alloy digging into the road, I would give myself a mental kick up the bum. When I took over at the 4 hour mark Neil Chivas was in the lead by about 30 seconds and I was able to steadily pare this away until Neil pitted with about 1 hour to go and I went into the lead. Jim Budd took over and really started a charge to wipe out my 30 second lead. I can remember watching my lap board showing a steady erosion of the lead and being unable to respond to the challenge. For about half an hour I just could not drag out that little bit extra to counter Jim Budd’s challenge. At that stage I had decided the piston / rev limit was academic and really took the engine to the red line with my lap times dropping consistently into the low 59s. With about 15 min to go I could see Jim Budd had given up the chase, but being so wound up I was not prepared to back off and kept the pace on right to the finish. By that stage I could come out of the stop corner with the rear end drifting comfortably just like modern day GP riders. After crossing the finish line and parking the bike for scrutineering it was later found to be out of fuel. I had finished the race on petrol fumes! Let me finish with some remembered ego boosters from the race. 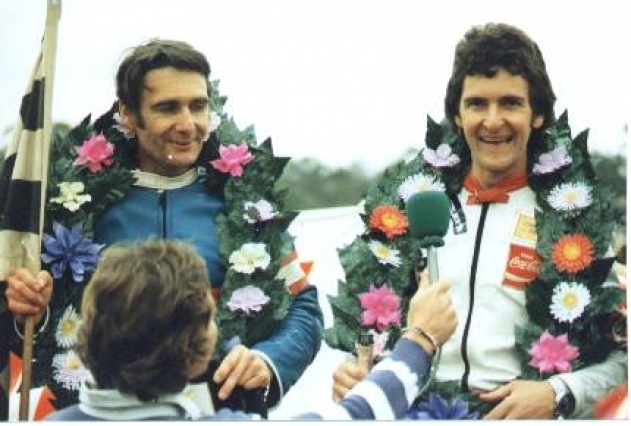 Number 1 was riding around Mike Hailwood who was riding a Ducati, number 2 was Helmut Dahne telling me he could not believe I had lapped him during the race and number 3 was the pleasure to have shared the win with Ken Blake.